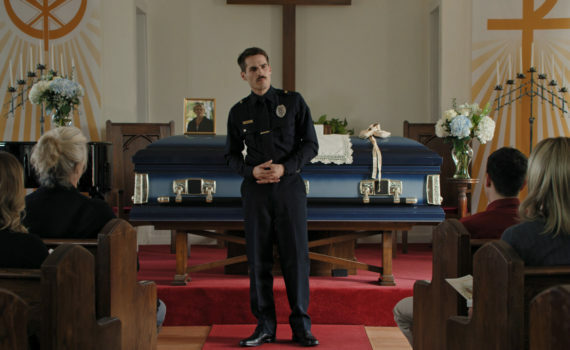 Thunder Road started as a short, and you can feel that very clearly in the feature adaptation of this odd, bitter, midnight black comedy. Comedian Jim Cummings wrote, directed, and stars in this offbeat, 90-minute extravaganza of uncomfortable moments and surprising heart. It’s one of those experience where you’re faced with the decision to either try laughing or die crying, because the pain is almost too much to take, and it’s, at the same time, pretty hilarious. Cummings knows that he’s created something special in this character and runs with the length of rope we allow him, to the utter horror of audiences, but also with our fervent support. It’s a tale of confusing emotions, that’s for sure, for us as well as for all the players involved. Officer Jim Arnaud has just lost his mother. Not that they were spectacularly close, but now that she’s gone, he’s beginning to understand that he didn’t treat her very well, that he should have tried harder, that he missed out on years of his life not knowing what he had before it was gone. Jim is also losing his wife, and his daughter might be taken away as well, so things aren’t going so hot, and this is one Texas policeman who won’t handle it very well. It starts at the funeral, where Jim gives a misguided eulogy, and his life spirals out of control from there, getting worse and worse by the day. He can’t figure out how to deal with the bumps under his wheels, and seems determined to drive himself right off a cliff anyway. Cummings succeeds in bringing something very raw, very wacky, and very powerful to the screen in this fleshing out of his original story. He created this persona, embodies it perfectly, created so many cringe-worthy moments, but somehow convinces us to love Jim despite his obvious and many flaws. The film is part Reno 911, part Napoleon Dynamite, with awkward situations around every corner and a hero who you just want to succeed, despite his complete inability to do that. The cop elements are hilarious, the fatherhood parts are painful, the entire thing is a riot of comedy and depression, and in the end I think all audiences can find something to laugh at, to relate to, and to cling on desperately.